After months of viral video teasing, this is the week when Nike finally unveils the Magista. If you hadn’t already heard, the Magista is Nike’s radical new football boot which is set to disrupt and redefine the concept of how performance footwear looks and feels. Building on Nike’s history of groundbreaking innovation and born from four years of R&D in the Nike Sport Research Lab, the boot is designed for the needs of the creative playmaker. With feedback from some of the world’s best attacking players, including Barcelona’s Andrés Iniesta and German forward Mario Gotze, the Magista is designed to enable devastating creativity in a game where space is at a premium. Providing improved fit, touch and traction, and built with Nike’s latest Flyknit technology, the boot delivers unprecedented control by creating a second-skin, sock-like feel allowing for strength and support to be knitted directly into the boot. The Magista also features a new mid-cut Dynamic Fit Collar for increased awareness of the body’s movements and interaction with the ground and the ball. As Nike’s design team worked to perfect the collar height, they found through player feedback that the Dynamic Fit collar not only provided a more locked-down fit, but that players also felt more confident and more aware of their movements. To provide additional strength for multi-directional movement, designers added Brio cables. These cables are knitted directly into the one-piece upper and lock the eyelet into the outsole, creating strength similar to a suspension bridge. “Our aim at Nike has always been to meet the athlete’s particular performance demands and amplify his unique set of skills. 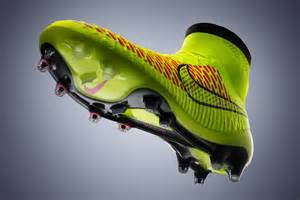 Magista inherits that transformative history of design and innovation and supercharges it,” Mark Parker, NIKE, Inc. CEO and President. 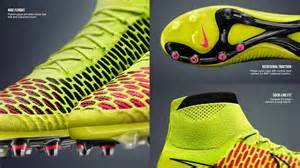 The Magista will be available for pre-order at Nike.com on April 29 and to purchase from May 22. Tags: Andrés Iniesta, Brio cables, Dynamic Fit collar, Flyknit, football, football boot, Magista, Mario Gotze, Mark Parker, Nike. Bookmark the permalink. A curator (from Latin: curare meaning "take care") is a manager or overseer. Traditionally, a curator or keeper of a cultural heritage institution (e.g., gallery, museum, library or archive) is a content specialist responsible for an institution's collections and involved with the interpretation of material. The future is the indefinite time period after the present. The plural form denotes an infinite number of versions and possibilities.